There are certain films you see that even years and years later you never forget and Sleepaway Camp released in 1983 is one of those films. As a child in the 80s I would rent horror films on a regular basis and once I got cable I would watch various horror films (or any genre really). There are films I saw as a kid and totally forgot and years later would buy or rent it thinking I’ve never seen it only at some point to remember the film. Sleepaway Camp like I said was one of those films that forever stuck in my memory and I suppose having sequels also played a part, but even if this was a one shot film I would have still remembered it and I think anyone who has seen this knows exactly why. I assume most people reading this already know the twist ending, but just in case I won’t spoil it. Sleepaway Camp has one of the if not the most twisted and shocking ending of any film I’ve seen and its one you never forget. 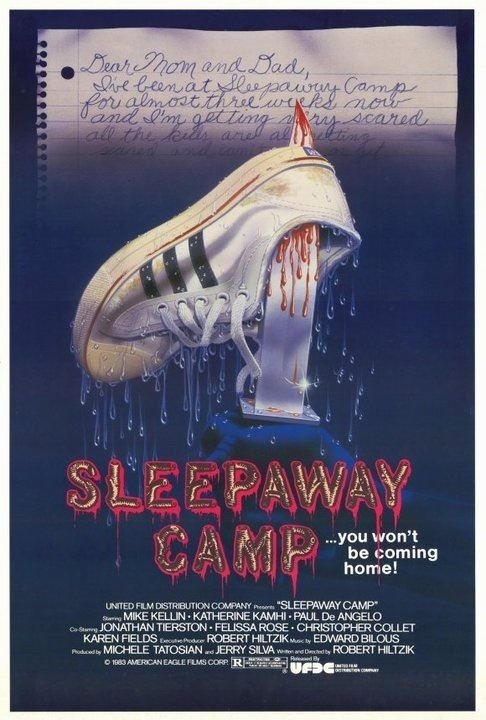 As I’ve gotten older while I still enjoy this, but I can say it doesn’t rate as highly with me as it once did and Sleepaway Camp is a cult favorite and I think the ending is the main reason. 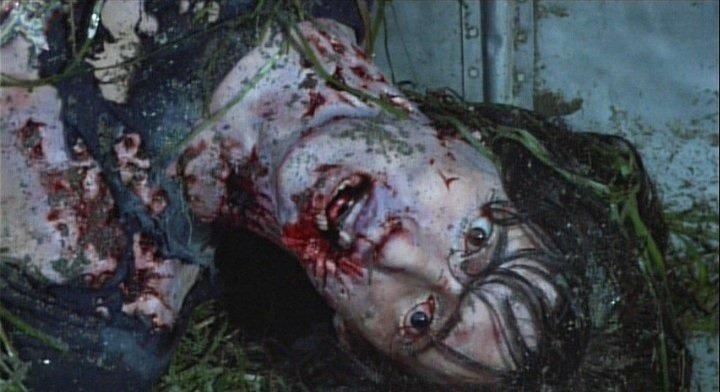 Even without the shocking ending I still think it would have a cult following rather than fade into insecurity, but lets be honest the ending helped keep this relevant among horror fans since its always the first thing mentioned. Besides the ending Sleepaway Camp also this perverse and even slightly sleazy feel; one scene has the cool at the camp referring to the children as baldies an even begins to unzip his pants when making a move on Angela (Rose). We also have the young and attractive counselor Meg meeting up with the older not attractive Mel who is the head of the camp. And when the twist is revealed that also adds a whole other dimension to the perverse feel. Sleepaway Camp isn’t very different than most slasher films however to call this a knockoff of films like Friday the 13th or the Burning due to the camp setting is totally unfair to Sleepaway Camp since it really isn’t like those films and while sure Sleepaway Camp doesn’t exactly stray from the typical slasher film of the time it also in other ways feels quite different. Even by 1983 the slasher film was starting to get a bit stale and while there were still many excellent ones throughout the decade we had to sit through a few more subpar ones to get to the good, but Sleepaway Camp does take a slightly tired formula and while I wouldn’t say makes it feel fresh, but doesn’t exactly rehash other films. In many of these films with a camp setting there often aren’t many campers if any. Despite popular belief only the original Friday the 13th, part 2 and part 6 are the ones with a camp setting (part 6 actually has campers) and the Burning has campers, but most are in the 16-17 age range whereas Sleepaway Camp also has older campers, but the good majority are about 13 with some being younger, which does make some of the deaths a bit more shocking. Sleepaway Camp was written and directed by Robert Hiltzik and from a plot standpoint there isn’t much happening, but that’s hardly a problem with a slasher film. The script while I can’t say is exactly well written, but it does feel authentic with the characters. All the kids are written in a very believable way and that’s the scripts biggest asset. The kids are quite obnoxious and in general not very likable with the exception of Angela who is quite sympathetic as she’s often the target of bullies at the camp. She’s shy and awkward and I think most of us can sort of relate to the character (well sort of). Ricky (Tierston) Angela’s cousin is a bit foul mouthed and at times can also be a bit obnoxious, but he’s still likable as he always sticks up for his cousin, which is the honorable thing to do. The script is quite odd and its not really well written, but the characters again feeling authentic and the perverse nature of the script in someways elevate it even if its never really all that great. Though when all is said and done the script serves its purpose and for better or worse has its own style. Like I stated Sleepaway Camp has a shocker of an ending and a very sleazy and perverse feel, but the movie is also very odd and that in part helps keep the movie above water. In terms of filmmaking Sleepaway Camp isn’t a very good movie even by slasher movie standards; the film while attempting a professional look is very sloppy and rough around the edges and this might make certain movies better like say Wes Craven’s Last House on the Left, but these traits will often sink a movie like Sleepaway Camp and while it doesn’t exactly help the movie at the end of the day it’s the weirdness, sleazy and perverse feel that elevates the movie and again the twisted ending. The screenplay by is rather weak and poorly plotted, but it actually works fairly well in regards that the teens and younger teens act the way they should. Their actions in the movie is very much what kids would do so in that sense Hiltzik gets things right, but besides that the characters though are mostly interchangeable and most of them aren’t very likeable. The script as stated has a very perverse feel as one character who is a cook at the camp refers to the children as baldies and is sexually turned on by the kids. The screenplay is just really odd at times and very sleazy and even though it’s poorly written for the most part these aspects sort of make more out of the script than there really is. As director Robert Hiltzik a very strange film and while the pacing can be a bit sluggish in spots the strange and perverse tone though help keep the film fairly interesting. Sleepaway Camp isn’t very well made in general as the production can be a bit sloppy in spots even by slasher film standards this is a little below par, but yet the film has this odd charm about it. The suspense and tension are mostly lacking and while there really are only two possible suspects, Hiltzik still does a fairly decent job at keeping you guessing and while its not overly shocking when you find out who did it you will be shocked by the twist, which will stay with you long after the film is over. Sleepaway Camp truly is one of the strangest slasher films ever released. 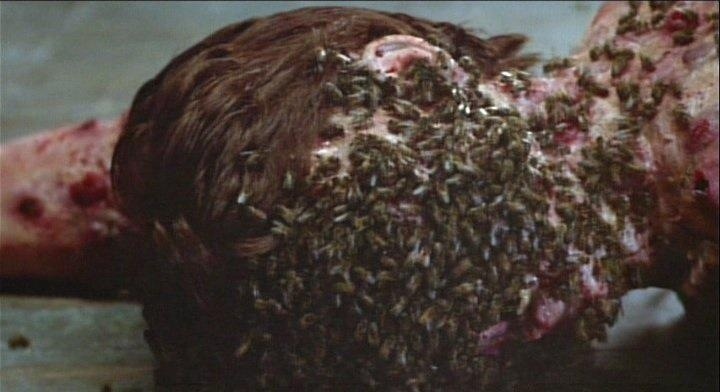 The film is quite odd with an ending that is a total jaw dropper. With strong performances from Felissa Rose, Jonathan Tierston and a wild and crazy performance by Desiree Gould that had to be seen to be believed help elevate Sleepaway Camp. While not my favorite slasher film of the 80s it is enjoyable and despite some sluggish pacing the overall weirdness and twisted ending help keep the film interesting.